Good explanation..I have one question, does the servers in the node, share the server filesystem(server related like wpconfig.properties etc) or do they have sperate file system..
they have a separate file system. But if you server is in a cluster, node agent performs synchronization of cluster related configuration using a file replication mechanism. That’s the reason you should keep system clock in sync across nodes in a cell. thanks for the explanation, now I know that server has spereate synchronized binaries in all the servers in a cluster. Now what happens when we deploy application on the cluster environment? does copy of ear will be created in all the servers? Exactly, Dmgr will send copies of the EAR to all nodes that own a server on the cluster that the application is deployed. It performs the same actions as if it were with configuration files. I am getting more and more information from your post. Now my question is, how the request is handled in a cluster? Does the request pertaining to one user is directed to particular node or it floats between the nodes? If it floats between the nodes, how the session management is done? I can guess that you mean a web request right? It boils down to the spec, it covers only that if the request is sent to multiple nodes in a cluster this session MUST be propagated. WebSphere by itself does not do load balancing for web request between servers in a cluster, you need to install IHS or Edge components for this purpose and how the request will be spread is responsibility of IHS and Edge. And this is also an option that is up to you, it depends on your load scenario, application requirements, etc. There are cases where affinity is the way to go, but affinity comes with the price that you might overload one server. Edge components provide an (almost) smart tool that can monitor IHS to check its load but still it can’t check WebSphere load. i’m getting more information from ur post. I had a doubt. node agent is connected to servers so when a node agent is down or it is not working. wil servers work or not. no. it wont work. another mandatory process is the dmgr. it seems like node agent play part of the role of a name server for the node. Wrong. Servers will work without the node agent or deployment manager. They cannot, however, be managed with the nice web-based GUI without the node agents and dmgr running. All of your traffic routing takes place within the web server plugin. If you have no node agents running, you cannot update the application from the dmgr, or start or stop the servers remotely. The node agents are responsible for inter-node communications only. If I have fifteen JVMs per node, all fifteen will run, but they won’t share any information when the node agent goes down. “The Node Agent must be running when starting the application server on that node so the application server can register with the Location Service Daemon (LSD). In WebSphere V6 the LSD is HAManager enabled therefore you only need one running Node Agent in the cluster to provide the LSD when the application servers are started on the node.”. node agent process is mandatory to start the application server on that node, but once the application server has been started, if node agent and DMGR goes down then also your application server will be able to server the requests. ple help to solve my problem.I created bus member,destination nd also message engine. message engine have to get started automaticaaly but it did not get start.unavailable symbol is showing. ple resolve my problem. Below mentioned is the error when i’m trying to start to start the message engine. “The messaging engine jaya-e6885a8c72Node01.server1-MsgBus cannot be started as there is no runtime initialized for it yet, retry the operation once it has initialized. If dynamic configuration reload is not enabled for this bus then the server will need to be restarted”. Probably you have anything wrong with your messaging engine runtime (eg. : your storage folder has files from a previous running engine or database tables are shared by multiple engines [tables for storage are exclusive]) check these common problems. Thanks this info especially the diagram gave me some basic ideas about the concepts. You may want to include some description of deployment manager, as it definitely works hand in hand with the node, cell concepts. Nice posting very informative. I have a question for you. I have installed multiple server instance under one profile. How do i manage those server, i mean how do i start and stop server. Do i need to have Node agent and Node configured for that. I am using WS v 6.1 Network Deployemtn with advance install option. Sincerely I never saw this error message … In regard to multiple servers on a single node, no problem it is perfectly fine, you’ll see the multiples servers at DMgr profile and you’ll also be able to select in which of them (server or cluster) your application module will be installed (you can even change it after it is installed under manage modules option). Then, after application is installed and if it is set to auto start with server you only need to start the corresponding server, for this to happen the node agent needs to be running (so the node is active). i have one question which was asked in an interview. there are 5 cells on a node .in order to do single sign on, hw many times we have to exchange the keys between these 5 cells? Sorry but I sincerely don’t know. I’d suggest that you ask this on WebSphere Application Server Forum. I am very much keen for IBM websphere ‘ Test 000-253: IBM WebSphere Application Server Network Deployment V6.1, Core Administration ‘. So Can please suggest best book for Test 000-253: IBM WebSphere Application Server Network Deployment V6.1, Core Administration except Red book. Sorry for not being able to answer this but although it might seem that I am an WAS admin (from some of my posts) I usually play this role but my main role is as an architect for J2EE solutions (nowadays most of them run on WAS) so I can’t suggest you any book for this particular WAS administration exam. Can you have more than one server within a node? Yes. As I said on the post: “The Node is […] built of […] and one or more Server instances.”. This is not the case for any of the currently supported releases of WebSphere Application Server (v6, v6.1, v7). The deployment manager is only needed for centralised administration & management of a WAS cell. Not for name server or any run-time service. 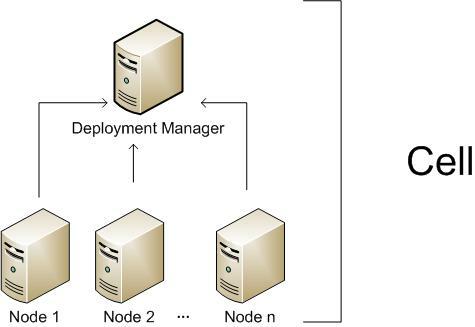 To start servers on the nodes, the node agent must be running, but the deployment manager doesn’t need to be running. Started application servers on a node no longer require the node agent. They can continue to function correctly with all name services, session management & fail-over capability without node agent or deployment manager. I’ll retry the tests I did … it was quite a long time ago and sincerely what you described is what I expected but I sincerely remember to see a server misfunction while nodeagent or dmgr is down. this notes is very good, but i need more clarification and explanation. so please provide the notes regarding the websphere server. As david has explained, node agent is no longer needed for the servers to be up and running unless you make any changes in the config repository. Deployment manager is needed only to centrally administer all servers and nodes. Its not required to keep DMGR running for the servers to be up and running. [6/10/10 22:20:33:916 BRT] 00000040 DiscoveryServ W DCSV1115W: DCS Stack DefaultCoreGroup at Member was1Cell01\was1Node01\server1: Member was1Cell01\was1CellManager01\dmgr connection was closed. Member will be removed from view. DCS connection status is Discovery|Ptp, receiver closed. [6/10/10 22:20:33:917 BRT] 00000014 RmmPtpGroup W DCSV1115W: DCS Stack DefaultCoreGroup at Member was1Cell01\was1Node01\server1: Member was1Cell01\was1CellManager01\dmgr connection was closed. Member will be removed from view. DCS connection status is View|Ptp, receiver closed. [6/10/10 22:20:34:331 BRT] 00000014 VSyncAlgo1 I DCSV2004I: DCS Stack DefaultCoreGroup at Member was1Cell01\was1Node01\server1: View synchronization completed successfully. The View Identifier is (9:0.was1Cell01\was1CellManager01\dmgr). The internal details are None. [6/10/10 22:20:34:575 BRT] 00000017 ViewReceiver I DCSV1033I: DCS Stack DefaultCoreGroup at Member was1Cell01\was1Node01\server1: Confirmed all new view members in view identifier (10:0.was1Cell01\was1Node01\nodeagent). View channel type is View|Ptp. [6/10/10 22:20:34:650 BRT] 00000017 CoordinatorIm I HMGR0228I: The Coordinator is not an Active Coordinator for core group DefaultCoreGroup. [6/10/10 22:20:34:889 BRT] 00000017 CoordinatorIm I HMGR0218I: A new core group view has been installed. The core group is DefaultCoreGroup. The view identifier is (10:0.was1Cell01\was1Node01\nodeagent). The number of members in the new view is 2. [6/10/10 22:22:00:070 BRT] 00000014 RmmPtpGroup W DCSV1115W: DCS Stack DefaultCoreGroup at Member was1Cell01\was1Node01\server1: Member was1Cell01\was1Node01\nodeagent connection was closed. Member will be removed from view. DCS connection status is View|Ptp, receiver closed. [6/10/10 22:22:00:068 BRT] 00000040 DiscoveryServ W DCSV1115W: DCS Stack DefaultCoreGroup at Member was1Cell01\was1Node01\server1: Member was1Cell01\was1Node01\nodeagent connection was closed. Member will be removed from view. DCS connection status is Discovery|Ptp, receiver closed. [6/10/10 22:22:00:160 BRT] 00000017 RoleViewLeade I DCSV8053I: DCS Stack DefaultCoreGroup at Member was1Cell01\was1Node01\server1: View change in process. Excluded members are [was1Cell01\was1Node01\nodeagent]. [6/10/10 22:22:00:185 BRT] 00000014 VSyncAlgo1 I DCSV2004I: DCS Stack DefaultCoreGroup at Member was1Cell01\was1Node01\server1: View synchronization completed successfully. The View Identifier is (10:0.was1Cell01\was1Node01\nodeagent). The internal details are None. [6/10/10 22:22:00:201 BRT] 00000017 ViewReceiver I DCSV1033I: DCS Stack DefaultCoreGroup at Member was1Cell01\was1Node01\server1: Confirmed all new view members in view identifier (11:0.was1Cell01\was1Node01\server1). View channel type is View|Ptp. [6/10/10 22:22:00:220 BRT] 00000017 CoordinatorIm I HMGR0218I: A new core group view has been installed. The core group is DefaultCoreGroup. The view identifier is (11:0.was1Cell01\was1Node01\server1). The number of members in the new view is 1. [6/10/10 22:22:00:751 BRT] 00000017 CoordinatorIm I HMGR0206I: The Coordinator is an Active Coordinator for core group DefaultCoreGroup. [6/10/10 22:23:48:749 BRT] 0000000a UserManagemen I CWWIM6001I Waiting for notification that the server has finished starting. [6/10/10 22:23:48:800 BRT] 0000000a ThreadPoolMgr W WSVR0626W: The ThreadPool setting on the ObjectRequestBroker service is deprecated. [6/10/10 22:23:49:086 BRT] 0000000a SASRas A JSAS0006I: Security connection interceptor initialized. [6/10/10 22:23:49:128 BRT] 0000000a SASRas A JSAS0001I: Security configuration initialized. [6/10/10 22:23:50:735 BRT] 0000000a SASRas A JSAS0007I: Client request interceptor registered. [6/10/10 22:23:50:795 BRT] 0000000a SASRas A JSAS0008I: Server request interceptor registered. [6/10/10 22:23:50:816 BRT] 0000000a SecurityCompo A JSAS0009I: IOR interceptor registered. [6/10/10 22:23:57:129 BRT] 0000000a StartUpServic I STUP0013I: The Startup Beans service has stopped. [6/10/10 22:23:57:149 BRT] 0000000a SchedulerServ I SCHD0040I: The Scheduler Service is stopping. [6/10/10 22:23:57:171 BRT] 0000000a SchedulerServ I SCHD0002I: The Scheduler Service has stopped. [6/10/10 22:23:57:228 BRT] 0000000a AppProfileCom I ACIN0009I: The application profiling service is stopping. [6/10/10 22:23:57:231 BRT] 0000000a ActivitySessi I WACS0049I: The ActivitySession service is stopping. [6/10/10 22:23:57:430 BRT] 0000000a CGBridgeServi I CWRCB0103I: The core group bridge service has stopped. The mentioned FFDC had the same ConnectException error message. I forgot to say: I am running 6.1.0.0 (no FP applied since it would take me too much time to download FP applier and FPs only for such a test). I am trying now to start nodeagent then server (I guess it’ll work) and then shut down later (but it’ll also work since I did a similar test as I mentioned on previous comment). I’ll also try to contact the friend that complained about misfunctioning bus when DMGR is down and I’ll also check at work if authentication (VMM and ActiveDirectory integration) works while DMGR is down cause I guess this is another thing that fails when dmgr is down… but that is only a suspicion. As I suspected… nodeagent needs to be up when server is going up, so it isn’t only for configuration as we suspected… it seems to play some role upon server startup even if server is brought up through command line. As a complement… I am still trying to figure out the issue a colleague faced with dmgr down but as the slide 8 suggests on http://publib.boulder.ibm.com/infocenter/ieduasst/v1r1m0/index.jsp?topic=/com.ibm.iea.was_v6/was/6.0/WLM-HA/WASv6_HA_Overview/player.html node agent needs to be running for HA. This RedBook explains better the node agent dependency: http://www.redbooks.ibm.com/redbooks/pdfs/sg246688.pdf on page 13. And after reading a lot I agree that the dmgr dependency my colleague saw was probably a misconfiguration somewhere or he was performing an external connection to a JMS queue or sth and he was probably specifying dmgr bootstrap port. actually some of you can have issues with websphere variables existing on diferent scopes. pay attention if any variable are created on more than one scope and also make sure that your environment are really synchronized. Fantastic post. Many thanks for your efforts. The pics are helpful and really helps the blog. indeed it works, and follows the very same rules for any other scoped resource, i.e. if the same driver is created on a more specific scope that one will override the cell-defined value. Nice post.. MAny many thanks… the pics were really helpful. How about profiles as a candidate to fit into the picture? Where would that fit in? For me, the documentation is saying that the node agent must be running to start the applications servers, but it says nothing about turning off the node agents after the servers started. I do not know if this is a stable environment or if it happens commonly, but I have seen servers running and no node agent process at all…. In fact that’s the point: nodeagent plays a role on server startup either it is from command line or from web based admin. What I tried to emphasize is that it isn’t bound only to server administration. 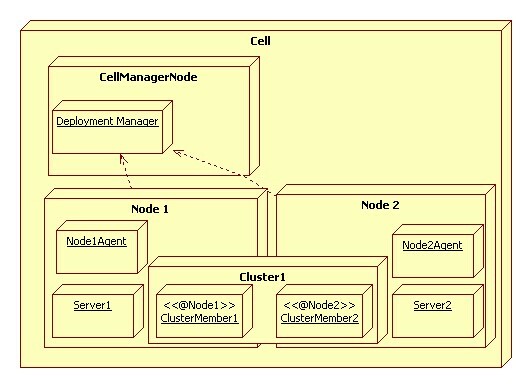 The image description is very easy to understand the Websphere basic concepts of Node, Cell and Cluster etc. Thanks for the same. Can you please clarify the link between Node, OS (e.g. Windows) and physical hardware machines (e.g. x86)? The node is a virtual unit built by the node agent and zero (although it does not make sense it is still a node) or multiple servers and it is hardware independent, so you can have a cell with nodes from multiple architectures. You can even have multiple nodes from multiple cells on a single server (it makes sense, for example, for hardware consolidation). Thanks for your quick & prompt reply. I am new to WAS and am trying to setup a cluster with 4 members [App servers] (2 from node on machine1 and 2 from node on machine2). What I dont understand is whether adding a cluster member is like adding an App server to the cluster ? 2. installed an App server profile on machine2 and federated the node it belongs to to cell on machine1. Now do I just go ahead and create the cluster via Dmgr and add 4 members ? or do i have to install more 1 more app server profiles each with existing nodes on both machines ? Exactly: the cluster member is simply an AppServer added as a cluster member. But if you want to have any fault tolerance you’ll have to create a node inside machine1 as well federated to the cell and add 2 servers on this node and 2 on the node on machine2. I am looking for a solution and found your blog, maybe you can help me? pleas. How i can get all Clusters members information (all servers) like host and etc? I need run diagnostics software environment on all servers(like dir, mqQueue) and then gather all information at one server and show in web interface. And I forgot not by AdminConfig..
when you say not by adminconfig you mean only invoking the binary or even importing the classes and invoking them directly inside your application? We have an Business application developed in .ear , this application,now the users want to implement in other country the application with other configuration.The applications are in the same server.There isn’t other server.I have created an new cell, because i need to isolate the two applications. if this correct? I have used different cell if it is true,can be for example different jvm argument,different directory to deploy the ear? when is AddProfile action useful ? Can you give a brief example please? This actually isn’t true. Starting in v6.1 you can create a process called a WebSphere Proxy Server to act as a client for web requests. The WAS Proxy Server is actually supposed to be the strategic replacement for the Edge Product, most of the functionality that existed in Edge should also exist in the WAS Proxy Server. WAS Proxy is also, in a simplistic sense, extremely easy to configure for simple routing, really just paying attention to the virtual host aliases is all that should be needed. Because the WAS Proxy is a WAS process, all of the data about the applications can simply be pulled directly from the cluster members hosting those applications. There are also a variety of options for affinity, and the capability for the WAS Proxy to route web requests to non-WAS processes (using Generic Clusters). If you are familiar with WebSphere EJB load balancing, the core of WAS Proxy functionality is pretty much the same, with a few implementation details that are different. As a preface for the various comments to come after this, most of my answers are centric to WebSphere EJB/IIOP routing and HTTP routing using the WAS Proxy Server, there may be differences in IHS/plug-in behaviors, as well as requirement differences in other areas of WAS, such as administration. I’m also only referencing v6+ behaviors, in part because v5 is now out of service and because v5 also has an entirely different set of needs (in short, just have the dmgr and NA’s running). Depends what is defined as information. From a config-file system sense this is probably correct. However, data can be shared through the HAManager component (v6+) between the application servers even without a deployment manager and a nodeagent. Although there probably aren’t too many scenarios in which this would really be useful. This is not entirely correct (you lose some failover capabilities with no nodeagents), but to really answer the root question of when do I need a NA or a Dmgr, lets discuss what capabilities are covered by each and what you may lose if they are not running. As mentioned previously, primarily for administration, but does own some additional capabilities with respect to EJB/IIOP routing, specifically the PreferLocal settings for all configured clusters and the weight tables for all of the members in all of the clusters. If the deployment manager is not running, the PreferLocal setting will not be honored, the default of false will be used. Changes to member weights will be ignored and all routing will take place as if the members had a weight of 2. In addition to losing the admin console, you’d also lose the ability to use the cluster mbean to invoke specific administrative actions on the clusters and cluster members, such as explicitly marking a server unavailable so that no requests will be routed to it. All of the Cluster-based MBeans reside on the deployment manager, so it must be running to use any of that functionality. Apart from that, you don’t lose much from a request routing perspective by the deployment manager being shut down. In short, the resolve from an indirectIOR to a directIOR is the reason a nodeagent must be running when the client first attempts to route to the cluster. After the resolve has occurred, the nodeagents can be shut down and routing can still function. The other main use of the nodeagent process with respect to EJB/IIOP routing is as a failover mechanism by the WAS routing code (WLM – Workload Management). In the event, for whatever reason, the client can no longer successfully reach a cluster member, the client will route the request to one of the nodeagents in the target cell as a failover mechanism. Because, by default, the cluster members must register with the nodeagent on startup, the nodeagents will always have the latest data about the cluster members and can update the client if its information has become stale or unusable. An example of this would be if a client process in CellA routes a number of requests to CellB:ClusterA, stops routing requests, all of the cluster members in CellB:ClusterA are shut down and restarted, and then the client process in CellA tries to route again. When the cluster members are shut down and restarted, they will come up on different dynamic ports, so the port information the client is holding onto is currently stale. It will attempt to route requests using the old data, get connection refused exceptions on each attempt, and when it runs out of members to try, the request will go to the nodeagent. The nodeagent will have the most recent port data, update the client, and the client can then resume routing successfully (all of this will be transparent to a user, they wouldn’t even know the client had to fail over to the nodeagent). If no nodeagents happened to be running, the client would not be able to get the new port information and would continuously fail in its attempts to route. So in summary, you need a Nodeagent to start up application servers, to resolve the initial request to a cluster, and the nodeagent can be useful in some failover scenarios. Tks a lot for the complete and deeply explained reply. I wouldn’t expect less from an IBMer. I am WebSphere Admin newbie. Thanks for the informative discussion. Excellent succint post on Websphere cell, node, server, cluster concepts. I wonder if it is possible to have one deployment manager shared among multiple cells? Great explanation. This is *much* better than the IBM documentation that I’ve seen. Thanks! rafaelri – Please clarify if it Is possible to have one deployment manager shared among multiple cells? Rafael, I enjoyed your explanation and I am hoping you could answer a question for me. Can members of a WAS cluster reside on different network segments, or must they all be on the same network segment? I know this can be done with recent versions of Weblogic but I am totally unable to find an answer for Websphere application server. We want to setup a WAS cluster spanning two different datacenters, but stretching VLANs across datacenters is a nightmare (says my telco experts)… so we’re trying not to go down that road. Any input or ideas appreciated! Thanks. I guess they can if they can reach each other through TCP (as I remember nodeagent comm was thru TCP) but I also guess they need to have a link between them with a good capacity otherwise synchronization would be poor. But that’s only guessing I have never done this and there’s been a few time since I last used WAS. P.S. : have you tried asking this on IBM forums? I used to ask a lot there and if you post like you posted over here (showing that you have researched before asking) people tend to answer!